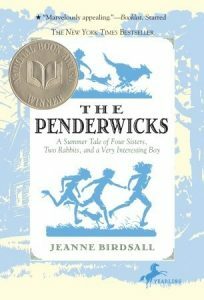 The Penderwicks Series by Jeanne Birdsall. These are all traditional family stories, almost a throwback to the first types of children’s books, which will appeal to a wide audience who likes historical fiction as well as contemporary stories with multi-sibling families. By Penny Peck, San Jose State Univ. Burnett, Frances. The Secret Garden. Enright, Elizabeth. The Saturdays (Melendy Quartet series). Estes, Eleanor. The Moffats (series). Larson, Kirby. Hattie Big Sky. McKay, Hilary. The Exiles (series). Montgomery, L.M. Anne of Green Gables (series). Sidney, Margaret. Five Little Peppers (series). Taylor, Sydney. All-of-a-Kind Family (series). Travers, P.J. Mary Poppins (series). Whelan, Gloria. The Locked Garden. Wiggin, Kate Douglas. Mother Carey’s Chickens. Wilder, Laura Ingalls. The Little House in the Big Woods (series). Wiles, Deborah. Love, Ruby Lavender.